Entrance to Leo Sarkisian Library, Voice of America HQ, Washington DC, 2014. Plaque on Leo Sarkisian Studio door at Voice of America HQ, Washington, DC, 2014. Leo Sarkisian in the VoA Library, 2012. 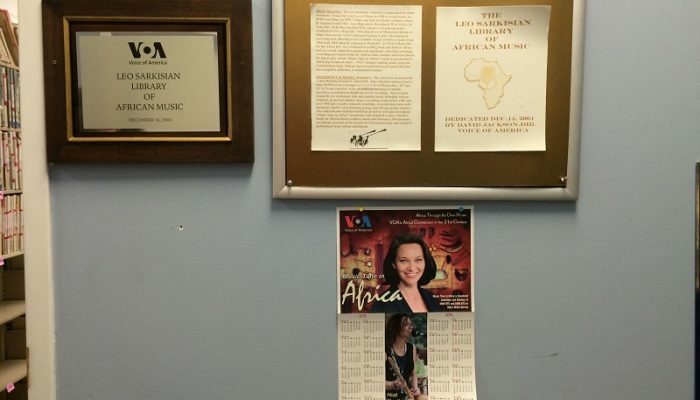 Music Time in Africa recordings in VoA Library, 2014. 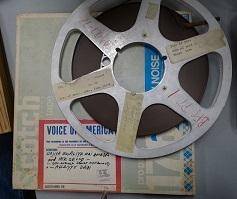 Tape recordings in VoA Library, 2014. 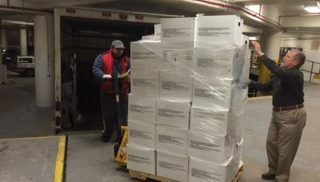 Shipping the Leo Sarkisian Library to the University of Michigan, 2015. 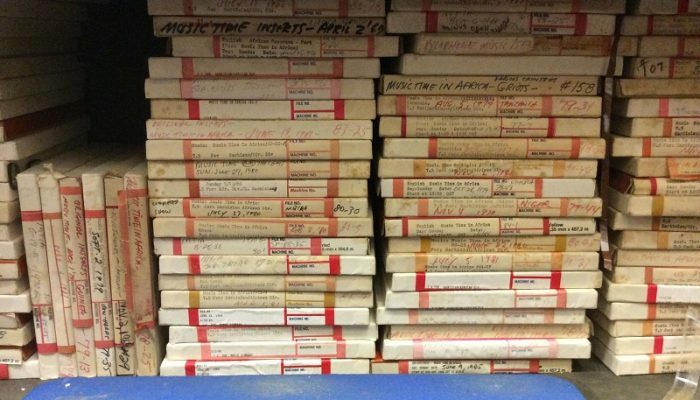 Music Time in Africa recordings in University of Michigan warehouse, 2015. 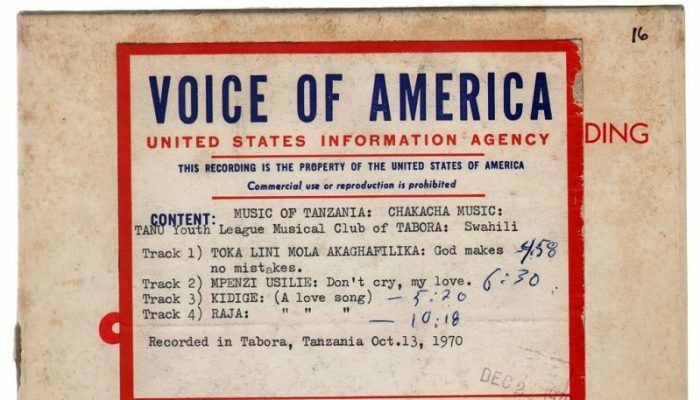 TANU Youth League Musical Club of Tabora, Tanzania, Oct. 13, 1970 [original recording]. 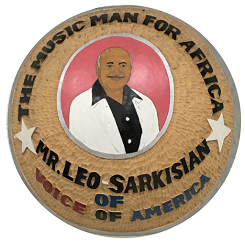 live performance recordings made by Leo Sarkisian in his travels through Africa or by African staff trained by Leo Sarkisian to make professional quality recordings on his behalf—often at the radio stations he helped found. 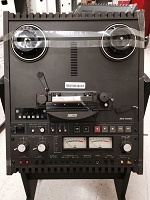 transferred recordings from other media to magnetic tape, created to support the production of the radio broadcast. commercial recordings acquired by Leo Sarkisian or sent to him by record companies and listeners in the form of LPs, 45s, and cassettes. 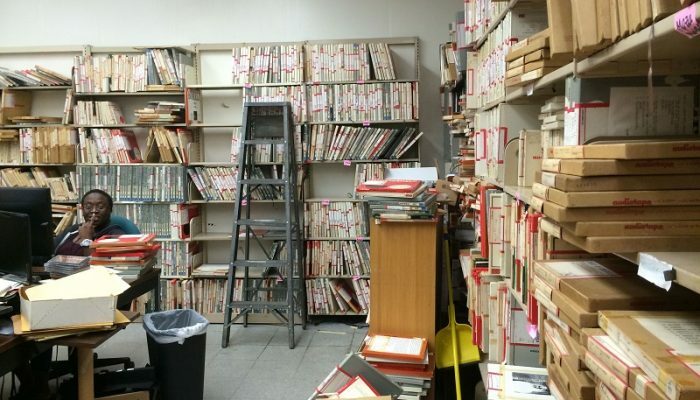 Transfer to the University redefined this once-active and organic music library into the static Leo Sarkisian Archive, housed by the University of Michigan Library in a group of 188 archival storage boxes, accompanied by brief item inventories. 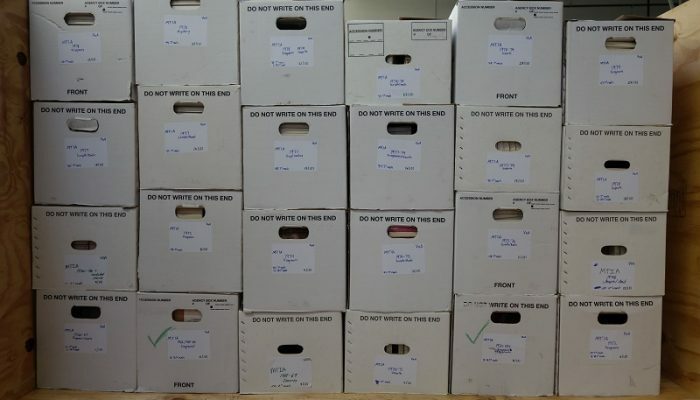 The University components constitute the vast majority of the original Leo Sarkisian Library, and now form a structured archival collection from which materials have been selected for inclusion in this project. 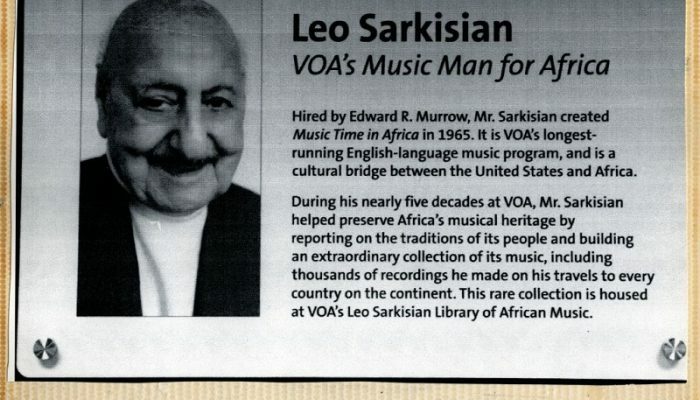 Leo Sarkisian embraced the full spectrum of African musical practices, including not only traditional forms of music, but popular music (ranging from jazz bands to Afro-funk), as well as gospel and African-composed classical music (opera and symphonies). Leo, furthermore, carries the singular credit for being the first ethnomusicologist to train African sound engineers, making possible African-initiated music archiving; this training process was part of his role as US cultural ambassador to newly-independent African nations, to ensure that Africans could carry on the work of documenting and preserving their own musical heritage. The Sarkisian collection contains both Leo’s own field recordings and recordings made by sound engineers he trained across the continent: Radio Tanzania, Radio Comores, Radiodiffusion nationale Tchadienne (Chad), Radio Dahomey, Radio Rurale (Burkina Faso), Radio Burundi, Radio Douala (Cameroon). 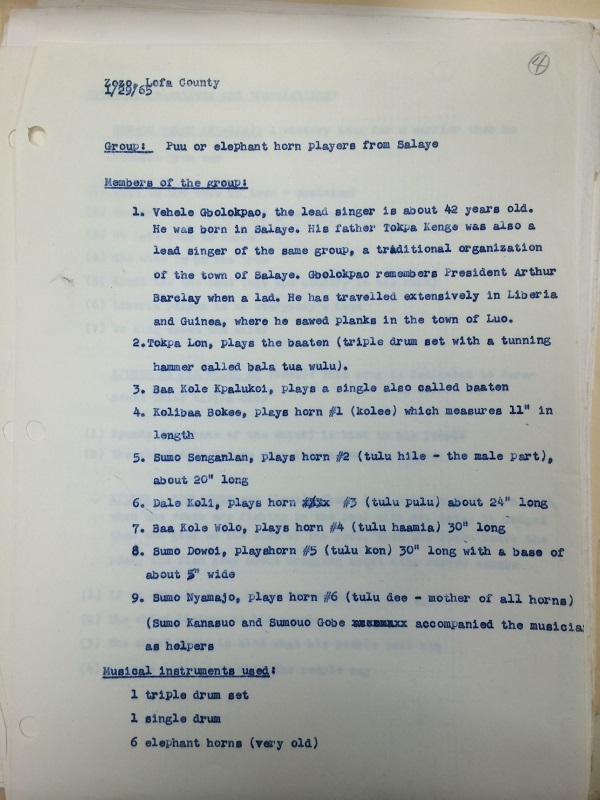 First, the Archive documents Leo’s role in training people in audio recording techniques in the countries he visited, and in doing so helped safeguard the vast and varied musical traditions of nations newly established and emerging from the ravages of colonialism. This musical conservation intervention has proved critically important, since colonial governments had argued that Africans had no culture worth preserving at all. 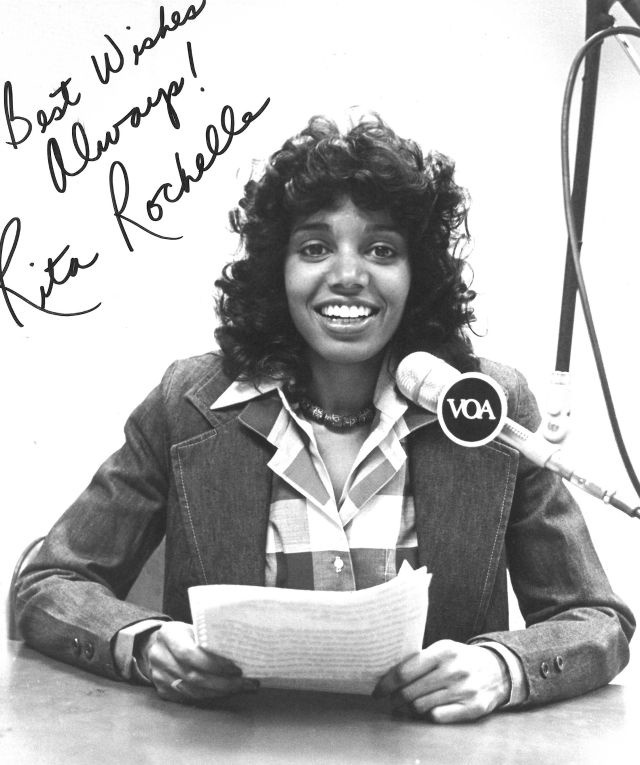 Third, the scripts and radio programs, bolstered by full field recordings, are irreplaceable primary source material. 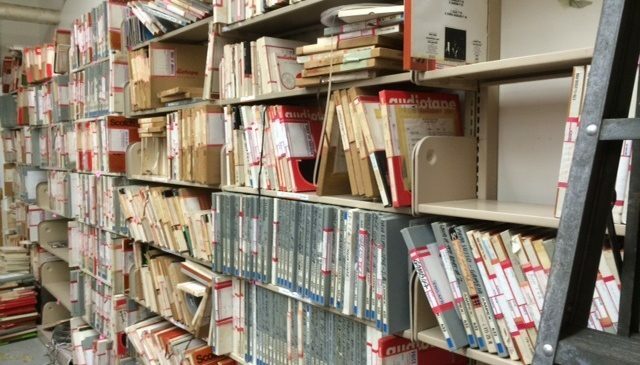 Because the recordings have not previously been accessible to scholars, digitizing major parts of it and facilitating access to it will enable researchers in the USA, Africa, and elsewhere to mine this curated collection for research, including (but not limited to) ethnomusicology, history, anthropology, folklore, literature, the fine arts, and cultural studies. Empirical, formal, and interpretive work in multiple disciplines is all deeply enabled by the Sarkisian materials. 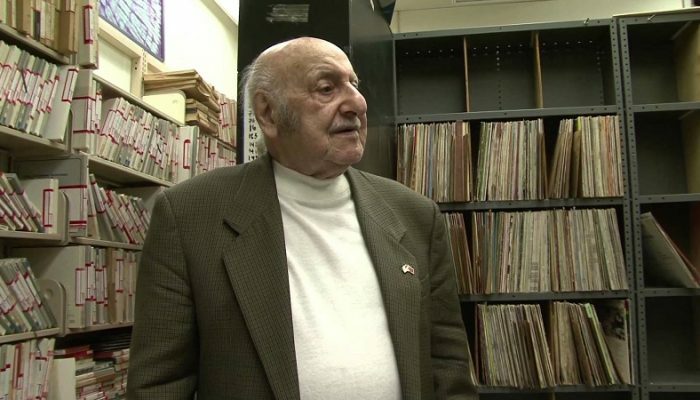 As the central component of the radio programs and the associated musical inserts, the heart and soul of the Leo Sarkisian Archive are the recordings that Leo made or fostered over a thirty-year period. The Archive is one of the top four collections of African musical heritage in existence, the others being the Hugh Tracey collection at the International Library of African Music (ILAM) in Grahamstown, South Africa, the Kwabena Nketia collection at the Institute of African Studies, University of Ghana, and the Gerhard Kubik collection housed privately in Vienna. All four collections span many African countries and ethnic groups; all include both traditional and popular musical forms. The Sarkisian collection, however, exceeds the others in its geographic and musical breadth. 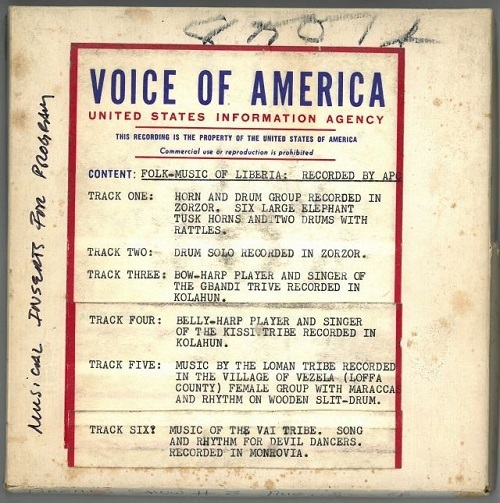 The Music Time in Africa recordings and associated live field recordings are neither duplicated nor truly complemented by Voice of America materials housed at the US National Archives and Records Administration and the Library of Congress. 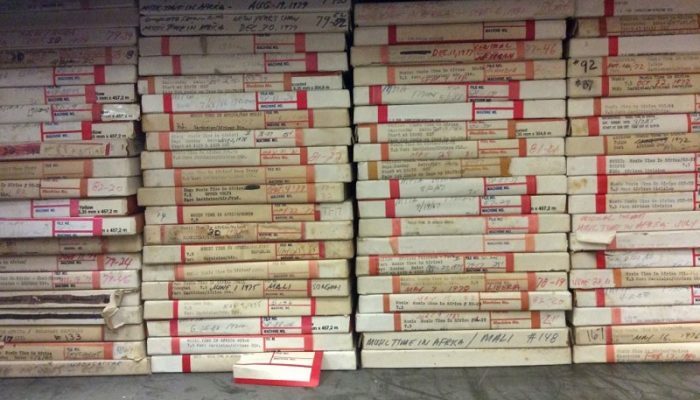 Additionally, the Leo Sarkisian Archive is among the very best documentary resources for studying the history of radio broadcasting on an international level.